In our new column "Get to Know," we will be discussing cultural icons of the past, whose legacy continues to influence art in our world today. 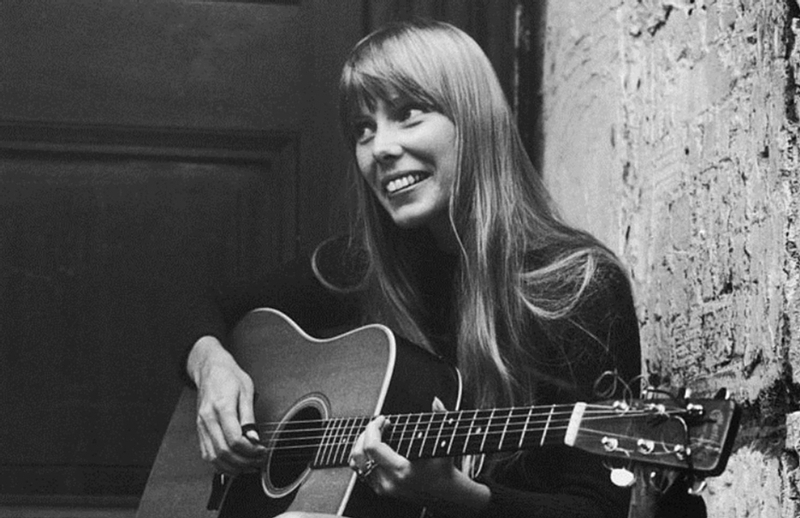 Joni Mitchell appears on the Canadian TV show Let's Sing Out when she is 22 years old. The emcee of the show, Oscar Brand, introduces her condescendingly. "A young lady has been writing songs since she came from Saskatoon a few years ago," Brand says. "She writes them beautifully, and she sings them beautifully, and she looks beautifully at the camera, too," he says, in a smarmy male host way. But when Mitchell begins to sing "Urge for Going," Brand stares at her quizzically, as if he is thinking, Wait, just who is this? He finally looks both perplexed and touched, and seems to realize his mistake. Brand seems to recognize that this girl with the long blonde hair and the very serious face is a major artist. Mitchell got polio at the age of nine, which is when she turned inward and started to think about singing. After dropping out of art school as a young adult, she busked on the streets and played small venues. In 1964, Mitchell found she was pregnant from an ex-boyfriend. Constrained by the social stigma of having a child out of wedlock, Mitchell placed her daughter up for adoption in 1965, a decision that would haunt her for decades. She married a fellow folk singer named Chuck Mitchell that same year and took his last name as her own. Mitchell recorded her first album, Song to a Seagull, in 1968, where she revealed both her high, shivery soprano and her sturdy alto voice (and her very Canadian vowels). Mitchell used the men she knew as muses and wrote about them in the way that Picasso and Willem de Kooning painted women. Her persona in her songs is restless and adventurous, and she does not write about wanting one man for life. Mitchell sings about needing another man and seeking another lover. On her second album, Clouds (1969), Mitchell offered the pure joy of "Chelsea Morning" and her signature song "Both Sides Now," which is written from a point of view that keeps hopefully enlarging. On the album Ladies of the Canyon (1970), Mitchell surveys a matriarchal world of plenty and love and security, but she adds melancholy piano chords to her vision here. She is a romantic, and she can be playful, but Mitchell can also be cynical, as when she sings, "Love is a story told to a friend/ It's secondhand." Mitchell takes on a male point of view for the song "The Arrangement," which is about a man who feels he could have been more than the name on the door on the 33rd floor of an office building. Could he have been? Mitchell probably thinks so, for she believes in possibility and in getting yourself free. She believes in changing so much that your friends shake their heads at you. The poetic words and images that Mitchell writes for these first three albums would be supple enough to just read on the page, but the melodies she fits them to lift the songs up into the realm of high art. It takes guts to write an album like Blue (1971), which is generally considered the apex of Mitchell's creativity. The inspiration for some of the love songs here was singer-songwriter James Taylor, one of those good-looking and taciturn men that she was drawn to for the creative trouble they might give her. She was moving way out on a limb for Blue, and it was out on this limb that she found the songs "River" and "A Case of You," where she sang that she could drink a whole case of her lover and still be on her feet. Mitchell will always be celebrated for the romance and the pain of "A Case of You," but like the best artists, she is someone who is never satisfied with anything. She is continually interrogating everything, and that includes herself. And this is why she includes the song "The Last Time I Saw Richard" on Blue, which is supposedly about her former husband Chuck. He has her number, telling her she likes "pretty men to tell you all those pretty lies." Court and Spark (1974) was her most popular album because it had almost a pop radio sound, and yet her melodies had begun to loosen. Many fans of that record were perplexed by The Hissing of Summer Lawns (1975), but this somewhat difficult album is ultimately just as good as Blue, and maybe even better because its perspective is so vast. Mitchell wrote character songs for The Hissing of Summer Lawns about men and women and reached a towering height on two tracks: "Shades of Scarlett Conquering," which is about a delusional problem woman warped by her relationship to sentimental movies, and "Harry's House," which feels like a Rainer Werner Fassbinder film about a middle-aged corporate man with an unhappy wife who keeps crying out, "Get down off of there!" and "Nothing's any good!" On this album, Mitchell sees the social structures behind individual sorrow and rigorously exposes them. Why do summer lawns hiss? Because of the gun-like suburban sprinklers shooting out hard jets of water. Hear the sound of sprinklers on summer lawns, and you get the sense of where she's headed musically. For Hejira (1976), Mitchell turned mainly back to herself, but on a more stark level where she seemed to be pushing against the limits of what words might express, until she finally sneers at herself, "chicken scratching for my immortality." Mitchell wanted freedom now in music as well, and that meant an increasing reliance on jazz musicians and sound esoterica. Her later albums were often preachy and dominated by her scolding puritan streak, but she stayed true to herself and her idea of love. Mitchell was reunited with her daughter in 1997, and in 2000, she recorded an album of standards with a large orchestra and a cigarette-lowered voice. She has been ill in recent years, but it sounds like she is on the mend. In interviews, Mitchell is reliably spiky and sure of herself, so much so that she feels she can criticize Shakespeare as a peer. But her best work is actually close to that exalted level, and her essential achievement feels secure. There should always be teenagers discovering her albums and listening to them over and over again in their bedrooms, and older people who take solace in her tough-minded brand of lyricism. This article has been viewed 1,378 times since being added on October 18, 2017.